The top 40 public OpenSim grids resumed their breakneck growth pace this month, gaining a total of 1,139 regions and crossing back over the 10,000 mark with a total land area of 10,427 regions. This was a growth of over 12%compared to last month, which translates to an annual growth rate of 256%. OpenSim growth was set back in July after a major housekeeping effort at OSGrid removed more than 2,000 unused regions from its accounting. Meanwhile, Second Life lost 238 regions over the same time period, falling to 31,573 regions, according to Grid Survey. 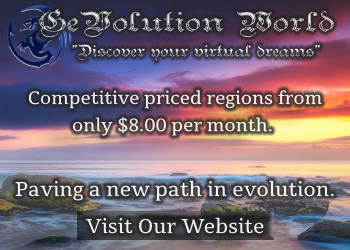 The biggest gainer, as usual, was OSGrid, which grew by 903 regions, a growth rate of 18%. The biggest gainer by percent was Avination, which went from 10 to 90 regions. MyOpenGrid also saw a big jump, from 101 to 148 regions. OSGrid, as usual, also had the largest number of users of any grid — 46,303 — and the largest number of active users, at 5,190. 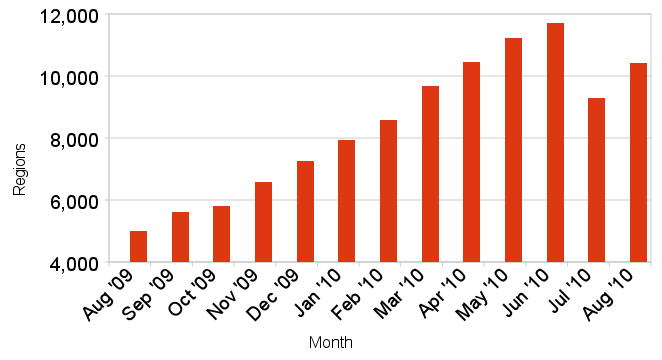 Active users are those who log in at least once over the course of the month. OSGrid gained more than 2,300 new users since mid July. GermanGrid tripled its user base this month after its merger with Grid4Us, growing from 526 to 1,693 users. The other big news this month is that some grids are now beginning to track their hypergrid visitors. At WilderWesten, for example, 27 users logged in the normal way, while 80 arrived via hypergrid teleport from other grids. My3DWorld saw 74 hypergrid visitors — compared to just 9 direct logins. We predict that hypergrid visits and unique visitors will soon become as important a metric for OpenSim grids as visitor counts are for websites. However, it is difficult to track hypergrid visits. Another option, if you have the OMC currency enabled on all your regions, is to use the OMC numbers. The OMC module tracks all visitors, and subtracting those who log in directly gives you a hypergrid visitor count, said WilderWesten grid manager Kai Ludwig. We’re now following 96 grids in our database, of which 77 were active this month. 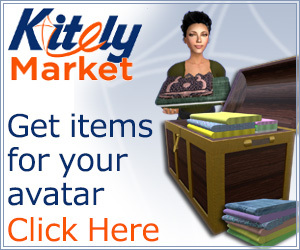 We’re also keeping an eye on InWorldz. They’re not technically an OpenSim grid — they branched off a few months back, and are now on their own codebase. However, they’ve been growing quickly in the past few months, now totaling 346 regions and 10,315 users. They added more than 5,000 users since the middle of June. We’ve got a few new grids that we’re tracking this month, including AlphaTowne, which launched at the beginning of the month with a whopping 76 regions, and YourSimSpot, which launched with 15 regions. Meanwhile, several old grids didn’t make the cut in this month’s list. Grid4Us merged with GermanGrid, v-Business and Southern Fun were suspended, and Minbari, KS Grid and a few other small grids are offline. Part of the reason is the normal ebb and flow of start-up grids. Other grids may be down because of the summer break, and will resume when classes are back in session. You can see all the data on this month’s active list in our August OpenSim Grid Statistics report.